Split cable and satellite signals without a connector cable or an external splitter by installing the Splitter/Wallplate Pro (Original). 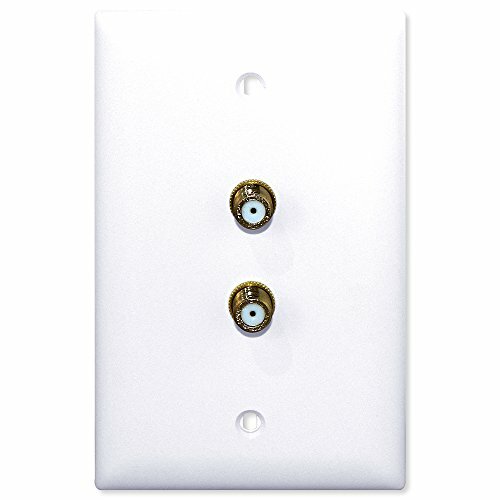 This single-gang wallplate has a built-in splitter, so you can connect two devices directly to your single cable signal. It supports direct connections for your TV, DVR, digital cable/satellite receiver, A/V receiver, cable modem, or any other coaxial device. The Splitter/Wallplate Pro is a two-way broadband-ready splitter that can be used for HDTV, satellite dish, and Internet modem/router installations. The coax cable inside your wall screws onto the back of the Splitter/Wallplate. Then, with the two included screws, you simply attach the wallplate to the wall. Designed for professional-grade installations, the wallplate features the Holland Electronics HFS-2D splitter, which offers bi-directional functionality for HDTV and Internet connections, as well as patented diode-steered power passing to one or all ports. Because fewer connections provide reduced signal loss, the Splitter/Wallplate helps improve signal performance, providing low insertion loss from 5 to 2150 MHz. With a soldered steel back and heavy-duty construction, the Splitter/Wallplate also eliminates signal ingress impairments by shielding against EMI and RFI. CONTENTS: Splitter/Wallplate Pro Original, (2) Mounting Screws. COLOR: White. If you have any questions about this product by Advanced Dynamics, contact us by completing and submitting the form below. If you are looking for a specif part number, please include it with your message.